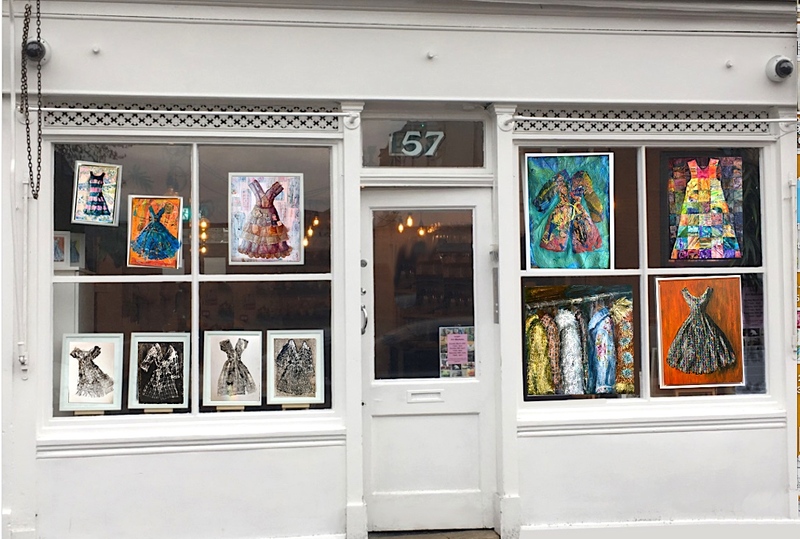 ‘Window Dressing’ Mixed media paintings, collages and collagraphs of dresses by local artist Suzsi Corio is currently on show at ‘Artat57' Window Gallery at 57 Northcross Road, SE22 9ET until 28th April. All work is for sale: prices from £45 - £675. Edited 5 time(s). Last edit was april 12, 06:14pm by Studio-S.E.2.2..
How much are the tiny ones on the shelf (on the left side of the picture?) Do you have more like this? The small (postcard sized) original watercolour studies of vintage dresses are £45 framed. Will you at the Art Market on 28th April, and if so will you have more small ones like those 10 in the photo? Thanks.